Losing weight is something that is a concern for many people and like many people, you have probably tried a few different types of diets in your lifetime. In fact, you may even have seen some success along the way but, as is often the case, that success is short-lived. Many people make the mistake of thinking it is the diet plan that they chose or perhaps they just feel as if they are lacking willpower. In reality, there is something else that is often lurking under the surface that keeps us from reaching our diet goals. I’m talking about a positive attitude and when we first start a diet, we are likely dealing with a negative attitude about our body image and perhaps even about ourselves in general. A negative attitude can be detrimental to your weight loss goals, but how can you make the switch and be positive over your efforts? When you learn how to do so, you will find that dieting becomes quite easy and it is more than just a way to lose weight, it becomes a doorway to a healthier lifestyle. The first, and perhaps most important thing to do if you want to stay positive about weight loss is to make your mind over. It isn’t enough to simply tell yourself that you are going to lose weight or to make some plans as to what you will eat. It has to do with your mental attitude and that attitude must be as positive as it can possibly be. From the moment that you decide to go on a diet and lose some weight, you need to see yourself as a thin person. This type of a positive change in our thinking can really help to motivate us and to make us take the necessary steps to finally drop the weight and keep it off permanently. Something else that needs to be considered is the motivation that is associated with weight loss, as this also reflects our attitude toward the system. Some of us may be attempting to lose weight because others feel that we should but if we are not doing it for ourselves, we have really lost the battle before we get started. If you truly want to lose weight, you have to have a positive attitude and know you are doing it for yourself. This isn’t selfish thinking, it is positive thinking and when you lose weight for your own reasons and your own benefits, it becomes a whole different ballgame. Starting the diet with a positive attitude is one thing but remaining positive as you are going through the process is quite another. All of us get discouraged from time to time and it is during those moments of discouragement that we often fall off the wagon and do something that we later regret. All too often, this stumble signals the crash and burn of our diet but it doesn’t need to be that way. As you are moving toward reaching your weight loss goals, continue to remind yourself on a daily basis of the reasons you are doing so and the benefits you are experiencing. Give yourself a weekly weigh-in and provide yourself with a reward (not food!). Take some time to focus on your health and keep close records as to any accomplishments that you have made. Doing so will truly help to move the needle in the right direction and it will help you to stay positive as you move forward. In addition, it will help you to remain strong, should you happen to stumble along the way. It is possible to get recordings of positive weight loss affirmations that can be played regularly and which may help you stay positive about weight loss. Some people may also find that hypnosis sessions can help. One other option that you may want to consider is enlisting the help of a friend that will become your weight loss buddy. Prior to the time that either of you goes on any type of diet or weight loss program, have a heart-to-heart discussion and let them know that your top priority is remaining positive. Make sure that they are on board and then you can work together in order to keep your attitude at a premium level. It is when you are positive over your efforts that great things will happen. It may be good for your health to lose weight if you are overweight or obese but getting the motivation to stick to a low calorie or very low calorie diet can be hard, especially if you are having to deal with hunger, which can be a problem for the first 3 days. The benefits can seem a long way off, while that piece of confectionery or extra dessert is immediate and may be right in front of you. Sometimes, we sabotage our own diet but other people can also cause problems for us, possibly jealous of our success in losing weight or through pity at seeing us struggle when we so obviously would love a cookie! Some people who do not need to lose weight do not seem to realize that “just one won’t hurt” or “a little bit won’t make any difference” makes it very hard for you to resist, especially when you would love to have some, or even a lot. They also do not realize that having that extra piece of food or a forbidden food can trigger cravings that will be even more difficult to overcome tomorrow. There are also those who believe they are telling us to stop dieting for our own good. In some cases that may be true. A person with anorexia or who is below the ideal weight for their age, gender and height should not be on a weight loss diet. But others seem to believe that weight loss is bad altogether. They may have their own reasons for saying this or even believing it, including the fear that they themselves may need to follow a similar way of eating or because they have been fed misinformation or misunderstood something they heard. So here are tips for overcoming the problems and staying on your low calorie diet. If you are having difficulties with someone trying to sabotage your weight loss diet, then ditch them, at least for a little while. The 8 week 800BSD is only for 8 weeks. If someone is trying to stop you from improving your health by losing weight with a recognized way of healthy eating, then they are not thinking of your health and you need to avoid them for a while or at least when you are feeling particularly vulnerable. OK, it’s not always possible to ditch them, so if not, try to avoid conversations about food or diet or weight loss. If they say something like “you’re looking so thin!”, then remind them that you are not yet at your healthy target weight or that you still weigh more than you did when you both first met and that you were not exactly skinny then! They have a picture in their mind of you as being an overweight person. They need to adjust their picture of you to being one of a person at their ideal target weight. That will take them time. It’s especially hard if the person who appears to be sabotaging your efforts is your nearest and dearest or your parent, who cooks your evening meal every day. They presumably have your best interests at heart but they also have their own interests to serve, even if they don’t acknowledge that. They may be proud of their cooking and feel hurt and rejected if you don’t eat it or not as much as previously. Try to get them on your side, so they are more concerned about your health than about their own cooking prowess. Try to get them to serve more salads and green vegetables and fewer potatoes or less pasta, bread and rice. Even if they are playing the guilt game “you don’t like my cooking any more”, try NOT to play them back, “you don’t care about my health”, but instead, let them know how thankful you are that they care about your health and that they take the trouble to make you a meal, which is much appreciated. Once they realize that their time and effort are appreciated, they may be more willing to make changes that can help. There are some foods you can eat without having to count them in your daily allowance. I have found fresh celery very useful. It’s only about 30 calories for 2 large stalks and that is very filling as well as providing useful fiber. You can cut up some stalks of celery and keep them in the fridge when you just have to nibble. 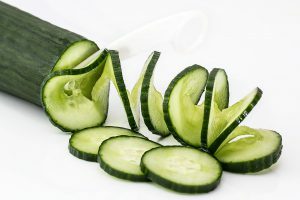 Cucumber is another useful vegetable. I buy a whole one and cut off a chunk every so often. I don’t count those in my daily allowance. 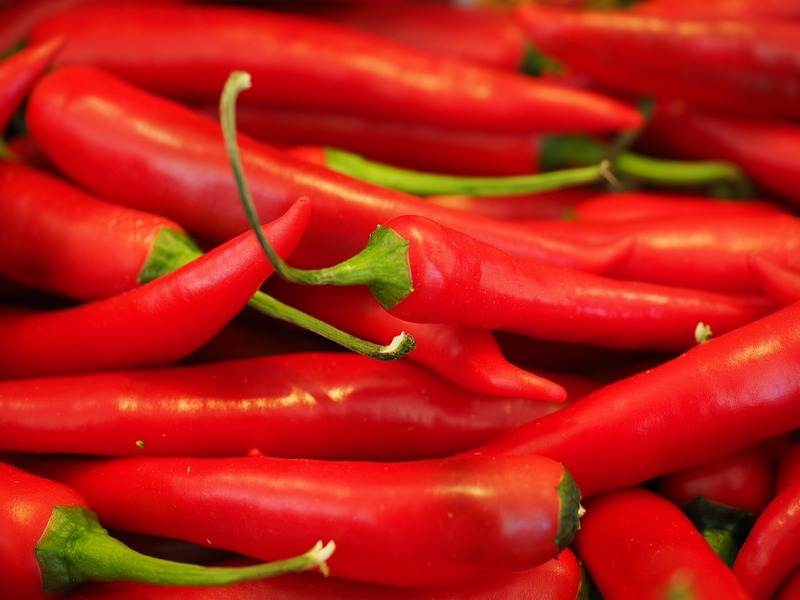 Occasionally, I buy a single red chili pepper and cut it up along with the celery, to give it a bit of “bite” but I try to make the chili pieces last at least 2 days. Sugar free chewing gum is another way of overcoming hunger. It doesn’t provide (many) calories but it gives your mouth something to do and overcomes mouth boredom which is sometimes translated as being “hungry”. Be careful with this though, if you are not used to it. Many of the types available contain phenyalanine which some people must stay away from and most of them can have a laxative effect, which may or may not be helpful to you. Eat plenty of green veg or green salads with your meal. Spinach, green beans, cabbage and broccoli (and cauliflower, though it is not green) will all fill you up and provide more fiber, without many calories, as will lettuce, cucumber and other salady green stuff. If you find you have eaten fewer calories than your daily allowance, make sure you have something quick and reasonable available so you are not tempted by cookies or candy. A small can of tuna has about 100 or 120 calories. A spoonful of mayonnaise has 100 calories, so you can make a quick snack of tuna and mayo to eat with a fork to keep you well fed and with no excuse for eating what you have chosen not to. If you have a favorite book or article that prompted you to get started on your weight loss journey, keep a copy of it nearby and read it again, to remind yourself of why you wanted to lose weight. Fear; and feelings of doom if you don’t lose weight may not be the best motivators but they may be what you need in order to stick to your diet at times. Get advice from your doctor. They may already have been trying to get you to lose weight. Some can be very helpful, though many were never trained in nutrition. If not, find a doctor with whom you CAN work and who will support you on your journey. Do you want to get a beach body for a special holiday? Maybe you want to get new clothing for an event, such as a wedding? Maybe you have had a diagnosis of diabetes, high blood pressure or high cholesterol and want to improve your situation? Reminding yourself of your reasons and what you will get at the end of your diet will help you stick to it. Keep a journal or a vision board. Write down your reasons for losing weight and find pictures that will show you how you want to look in 6 weeks or 6 months’ time. Maybe one of you at an earlier age or someone who looks similar to what you want to look like. Keep a record of what you DON’T eat when you are tempted and give yourself a reward for that. Even a check mark in a list can keep you going. You could always give yourself a small monetary reward for 10 check marks and save it towards something special, maybe new clothes or a special outing. Keeping a record of what you DO eat can also be motivating. The very fact of having to record it, may help you avoid eating something on the no no list. Keep a record of meals you CAN eat and enjoy and a record of calorie counts in case you are worried about going over your allowance or can add something extra in.